Construction business is full of risks – and we all know that suit happens – lawsuit that is. But rather than being overwhelmed by worry and fear, you can take measured steps to protect your business. LiveRate® at Ideal Choice Insurance Agency assists you in minimizing the financial implications of future uncertainties (a.k.a. claims and losses) by comparing rates for business insurance, worker’s compensation and commercial auto with leading low price insurance companies. LiveRate® is a free service for comparing rates, allowing you to shop for – and buy – insurance that best fits to needs. What you get from us is factual and helpful information since we are not an insurance company – and you are never under any obligation to purchase. LiveRate® does not require your contact information to provide you with free insurance rate estimates. We know your time is too valuable to spend it on lengthy forms. That’s why we have designed ours to be hassle free and super easy. Just spend a minute or two on our secure form to receive a number of customizable policy estimates – we do not sell your information – and only one (1) agent will call you – but only when you request a call! After comparing rates with LiveRate® you’ll not only get great contractor’s insurance coverage – you’ll also get it at an affordable rate, payment plan and a flexible down payment too. You can contact us with any questions you might have – we’re happy to help match your insurance needs to competitive rates and options. 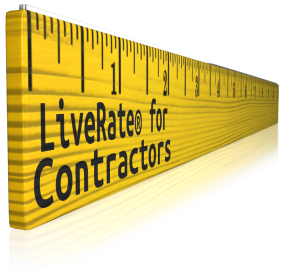 Measure twice and cut once by comparing rates with LiveRate® for Contractors.